Depression is very different from just feeling unhappy. Usually, there is a reason for unhappiness such as being rejected or not getting the job you wanted. Depression is a pervasive feeling. It’s almost as if you are in a black tunnel with no light. There are ways to alleviate the symptoms of depression. Mindfulness involves focusing on the present moment and is a skill that needs to be practiced. More often than not, our brains are full of thoughts and focusing on the present moment seems unnatural for our minds. Focus on touch, taste, sight, sound and smell. Engaging the senses leaves less time for worry. Think music as food for the soul. An upbeat tune can change an atmosphere instantly and create a more positive vibe. Listening to upbeat, happy music alters brain chemistry and can improve your mood. Science shows that touch therapies can help some people overcome depression, lower the stress hormone and increase the feel-good hormone. Therapies to consider include acupuncture, acupressure, massage, reiki and reflexology. Research has shown that depressed people often lack a fatty acid known as EPA. Omega-3 fatty acids can also lower cholesterol and improve cardiovascular health. Get omega-3s through walnuts, flaxseed and oily fish like salmon or tuna. Depressed people tend to see the world in a negative way. When things go wrong they blame themselves and when they go right, they put it down to luck. Don’t take your thoughts seriously when you are feeling low. .
During depression, we tend to see the negatives in everything and find it harder to be balanced about what is going on. Remind yourself that change is constant and that you won’t always feel this way. Be patient and do your best to look after yourself in the meantime. Eat well and get a decent amount of sleep. Say to yourself “This shall pass”. If possible, do your best to distract yourself from over thinking. Play with a pet or go for a walk. Read a book if you are able to concentrate or finish a puzzle. Do anything that takes your mind off your fears and worries. Seasonal Affective Disorder (SAD) is known for causing low mood over the winter months when there is less sunlight. Invest in a sunlamp – a 300 watt bulb within three feet for 20 minutes three times a day can help. .
Cognitive therapy can be extremely useful in counteracting depression and is based on the principle that certain ways of thinking can trigger certain health problems, such as depression. The counsellor helps you to understand your current thought patterns and identify any harmful or false ideas and thoughts that you have that can trigger depression or make it worse. The aim is to change your ways of thinking to avoid these ideas as well as help your thought patterns to be more realistic and helpful. A journal can work in two ways. Use it to write down fears and worries. Sometimes, having an outlet in this way can be soothing and ease your mind. Another good way to use a journal is to write at least five things down every day that you are grateful for. This forces us to think more positively and can help to remind us that things are never that bad. A stranger smiling at you, the sun shining..anything positive will do! This can be one of the hardest things to do when feeling depressed but it is one of the most rewarding activities. Force yourself to go out. This can have a huge positive effect on your mood. Sleep and mood are closely connected. Inadequate sleep can cause irritability and stress, while healthy sleep can enhance well-being. No other activity delivers so many benefits with so little effort so aim for between 7.5 and 9 hours sleep per night. Regular exercise has benefits for helping to overcome depression. Experts advise getting half an hour to an hour of moderate exercise, such as brisk walking at least three to four times per week. Depression can make you want to hide away from the world and disappear. 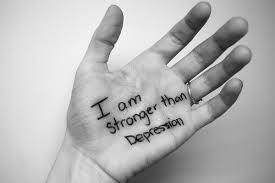 It can be well managed and there can be a wonderful life beyond depression. Hang in there and keep the faith. Although the above suggestions can be effective, depression that perseveres should be investigated further and seeing a Doctor to chat over any symptoms is a step in the right direction. How are you at a risk of infertility? Nose Bleed (Epistaxis) Bleeding from one or both nostrils is known as epistaxis or nosebleed….